Airbike is a dockless bike sharing platform that is designed to make inner-city transport fast, convenient and eco-friendly. Airbike uses patented technology, developed in Australia that combines with the Airbike smartphone app to bring you greater access and convenience to a bike when you need it the most. Australia is a vast country. Even our cities are difficult to get around without private transport. We want to become a revolution in the way Australians move. In the cities we operate we want to provide environmentally sustainable, convenient and affordable public transportation through bicycle sharing. From where you are to where you want to go, Airbike has the wheels to re-imagine the way you move. Our dockless system means that you have the freedom to explore, create and share even more moments and memories. Now that’s a breath of fresh air for you and our earth. Manually slide the lock through the wheels and into the locked position. You should hear two beeps upon successfully locking the bike. If you did not hear any beeps and are unsure if it is locked, please contact us. Where do I place the helmet? Lock your helmet to the bike by sliding the lock through the helmet straps. What happens after I lock my bike and helmet? You trip ends immediately once you have manually locked your bike and helmet. You will then receive a trip summary in the Airbike app. If you didn’t hear the 2 beep sounds when locking the bike, you can try to wiggle the lock’s red handle to make sure that it’s locked properly. If it’s still open try to lock it again and repeat the process to check it is properly locked. If the app still doesn’t respond or the lock doesn’t manually lock you can report the bike’s problem through the feedback section of our app. If you tried all the above and haven’t received a trip summary, please contact our support team at support@airbike.network for further assistance. If you are having connectivity problems or the lock isn’t unlocking, ensure that your 3G or WiFi is on. If you hear a beep but the lock is stuck, you may be required to give the lock a wiggle. If the lock still doesn’t unlock try re-scanning with the app. Ensure that the bicycle is displayed on the map for the app otherwise it might be defective. Can I ride with multiple people? Yes, but each rider needs to have their own Airbike account, and unlock their own individual bike. You are unable to unlock multiple bikes at the same time on one account. Please check that you have enabled notifications for your Airbike app in your phone’s settings. After locking the bike and hearing the 3-beep sounds, you can try relaunching the Airbike app on your phone. If you didn’t hear the 3-beep sounds when locking the bike, you can try to wiggle the lock’s red handle to make sure that it’s locked properly. After that, relaunch the Airbike app. If you have tried all of the above, and are still having issues, please contact us. Email us support@airbike.network . We will review your trip and end it from our side. Don’t worry about your payment. We will ensure that the correct amount is paid/refunded. Download the Airbike app from Google Play Store or iOS App Store. Open the app and sign up through Gmail, Facebook or create an Airbike account through our form. Ensure that you have verified your account by clicking on the link sent to your email address. How much does it cost to use Airbike ? A single trip costs $1.30 for every 30 mins. Your ride time will start after you unlock your bike. The timer will reset once the bike has been locked. Airbike fees are based on the duration you use the bike. A coupon provides you a free trip that is automatically used when the bike trip finishes. You can find occasional coupon codes on our social media pages. A coupon can also be obtained by inviting new users to the Airbike app. This can be done by sending them a referral link through the Airbike app. For every user that signs up with your referral link, you earn a free coupon to use on your next trip. How do activate my coupon? Once you have your code go the Airbike app and log into your account. Click on menu, then Coupon and hit the green button (located in the bottom right corner) and enter your code. This coupon will be automatically used on your next ride and you won’t be charged for your trip. 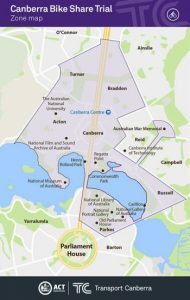 Airbike is currently working with Transport Canberra to provide services in Canberra. We encourage you to park inside the operational zone, which can be seen in the Airbike app or in the map below. Whilst you are able to ride Airbike outside of the operational zone, you are encouraged to bring the bike back inside it to ensure that there are enough bikes for other users to ride. Where should I park after I’m done? When you finish your ride, find your nearest designated parking zone via the app. If you must park somewhere else, use common sense. Park in an area where it is safe to do so, and will not cause any disturbances or inconveniences for the public. Also, ask yourself “is it in the way of can the next person use it?”. Consider people with mobility or vision impairments, so as not to cause any unnecessary inconveniences. Don’t park within a public road, driveway, public/shared path, traffic islands, median strip, and car parking bays (including loading zones, disabled zones etc.). Do park at least 10m back from the hold-line at any road intersection, roundabout, traffic island or median strip, and pedestrian crossings. Park 5m away from a bus stop shelter, marker post, steps, ramps, public toilets, building access points etc. You can use the Airbike app to locate the nearest available bike through the map view. Look at your surroundings and across the streets as the bike location in the app may be affected by the surrounding environment. If you see a poorly parked Airbike, please contact us. Please do remember to include the bike number in your message. Report it in the feedback section by scanning the bike’s QR code and selecting the bike’s fault.